Moist and easy upside down banana bread that can be served by itself for breakfast, or with ice cream for dessert. The best banana bread ever! Who doesn’t love bananas? What’s more, from fruit salads to desserts, this fruit delivers, big time. A great example is this tasty, caramelized upside down banana bread — a recipe adapted from Dessert Before Dinner. Yeah, baby! Today is SRC– Secret Recipe Club day!!! Although the original recipe is a simple yet delicious banana bread, it caught my eye. In my home country, Brazil, we enjoy upside down banana bread with cafezinho (a small cup of our strong coffee) or, with a cup of tea. 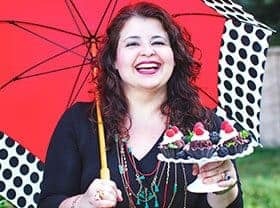 Dessert Before Dinner is a blog authored by Stephy, a home baker from Arlington, Virginia. Although I enjoy her recipe as it is, I had to put my own little spin on the recipe in order to make it my own. In this way, her Best Ever Banana Bread became our Upside Down Banana Bread. A few changes were made to the original recipe, particularly the addition of a banana topping with caramel sauce. As always, you are welcome to try either recipe, or to put on your own personal touch(es) as well. I also have to say that following Stephy’s banana bread batter recipe yielded some surplus batter. I mixed this extra banana bread batter with Nutella and baked in a mini muffin pan. We took care of the leftovers quickly though. 🙂 My kids can vouch for that! Prepare the banana bread batter: In a large bowl, sift the flour and mix with baking soda, salt, cinnamon, and nutmeg. Set aside. n a bowl of an electric mixer, cream together butter and both sugars. Add eggs, one at a time, beating after each addition until just incorporated into the batter (please, do not overbeat!!). Beat in half of the flour mixture at low speed just until incorporated into the batter. Beat in half of the applesauce. Beat in the remaining flour mixture, and then the other half of the applesauce. Mix in both the mashed bananas and vanilla. Set batter aside. Prepare the banana topping: Place 4 tbsp butter and 3/4 cup brown sugar in a small saucepan and stir over medium heat until butter melts and the sugar has dissolved. Without stirring, continue cooking for a few more minutes or until bubbles just start to form around the outside edges of the mixture (i.e. the sugar begins to caramelize). Stir and then pour into a loaf pan. Evenly arrange the bananas slices, flat side down, on top of the caramel. Pour batter over bananas and bake loaf for 55-70 minutes or until a toothpick inserted in the center comes out clean. To avoid the top of the upside down banana bread loaf becoming too brown, cover loosely with a sheet of aluminum foil after halfway baked. Let upside down banana bread loaf cool in pan on a rack. Run a knife around the edges to loosen loaf from the inside of the pan and invert onto a plate. Enjoy upside down banana bread warm by itself (for breakfast), or with vanilla ice cream (as a dessert)! Use any remaining batter to make muffins. Store banana bread covered either at room temp for up to 2 days, or in the fridge for up to 5-7 days. Do NOT FREEZE otherwise banana topping would be mushy. Moist and easy upside down banana bread that can be served for itself for breakfast, or with a scoop of ice cream for dessert. The best banana bread ever! In a large bowl, sift the flour and mix with baking soda, salt, cinnamon, and nutmeg. Set aside. In a bowl of an electric mixer, cream together butter and both sugars. Add eggs, one at a time, beating after each addition until just incorporated into the batter (please, do not overbeat!!). Beat in the remaining flour mixture, and then the other half of the applesauce until just incorporated. Mix in both the mashed bananas and vanilla. Set batter aside. To prepare the banana topping: Place 4 tbsp butter and 3/4 cup brown sugar in a small saucepan and stir over medium heat until butter melts and the sugar has dissolved. Without stirring, continue cooking for a few more minutes or until bubbles just start to form around the outside edges of the mixture (i.e. the sugar begins to caramelize). Stir and then pour into a loaf pan. Evenly arrange the bananas slices, flat side down, on top of the caramel. Store covered either at room temperature for up to 2 days, or in the fridge for up to 5-7 days. Thanks a lot, Deanna! My family devoured this bread pretty quickly. One of my children asked me to make it again.It was quite moist and delish as well. Oh my goodness! This bread looks amazing! What a fun (and amazing) twist on the traditional banana bread. Looks heavenly! I think you improved on my recipe immensely! 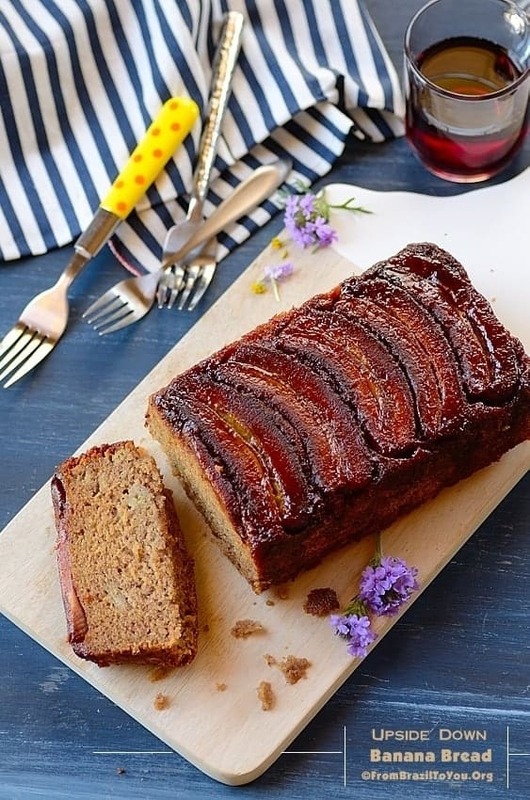 I’ve never thought of make upside down banana bread but this looks absolutely wonderful! I will absolutely make it this way the next time I make banana bread. Hi, Stephanie! Thanks a lot for your kind words. Your bread batter was quite moist and delicious. I only put a topping. One of my children loved it so much that she asked me to make this again — and she is not a fan of bananas. Wishing you a great week! I love any variety of banana bread and this one looks especially good = double bananas! Fun to be in Group C with you! I love this idea of having visible pieces of banana in the bread! I would totally add chocolate chips to mine too! Chocolate chips in it is a great idea. Thank you, Panos and Mirella! It is always a pleasure! This is new to me, I never had used banana in an upside down cake. What a great mashup, look at all that caramel. Woow Bananas and caramelized count me in girl :). I’ll answer your question of who does not like bananas… My poor kids and hubby!!! I love bananas and they do not.. can you imagine how miserable I am :)???? great work dear. Thanks so much, Amira! My eldest daughter hates bananas since she was little. I gave her a piece of this bread and she loved so much that she asked me to make this again. I am glad that she at least enjoys bananas in baked goodies. Oh Yum! How did I miss this wonderful post! Your upside down banana bread looks too gorgeous to be called a bread Denise:-) I love your spin on it! Thanks, Sonali! I do love to put my own spin in recipes. I LOVE your rendition of this bread Denise. It is gorgeous and sounds wonderful. How fun that you put the bananas on top (or bottom) really awesome! 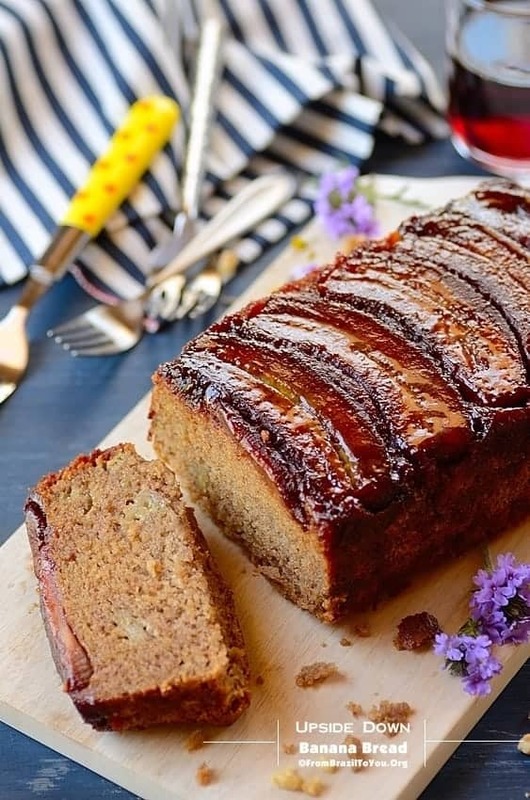 Love banana bread and love the twist of the way you have done this one! What an amazing twist on banana bread! You rocked this SRC recipe, Denise!! You are so sweet, Liz! 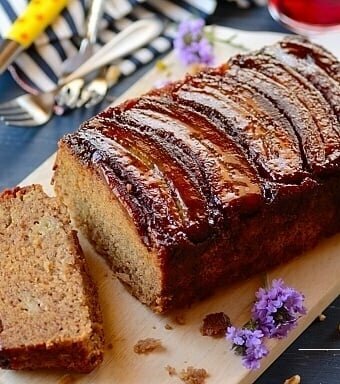 You are right, everybody loves banana and this bread looks fantastic. Just by looking at these beautiful pics, I can imagine the aroma of this amazing banana cake while baking. Would love to have this with a cafeciño! Daniela: Thank you! It had a great aroma indeed…Wishing you a great day! Denise – thanks for sharing this recipe – wow – what a moist bread! The banana topping in this upside down banana bread is a brilliant addition! Oh Denise, what a tempting Banana Bread recipe! I can imagine everyone wanting a slice with the bananas! Love bananas and bake with them often! One thing I haven’t tried yet is the upside down banana bread! Looks so good – I’ve got to try it! We all love bananas in my family …. and yes completely agree, what great flavors it adds to bread! lovely photography and would love to try this at home! Thanks, Deepti! You won’t be disappointed by this treat! Love the idea of upside down banana bread! And it looks so interesting, too. Love the idea of this — thanks. John: I am so glad that you enjoyed the idea of an upside down banana bread. Me three, Sarah and Arkadi! This with cafezinho is heavenly! The bread looks absolutely divine! Hi Denise, this looks so yummy. Avoiding sugar so could I use honey, maple syrup or something else in it’s place? 1. Honey and maple syrup are sweeter than sugar, so use less honey or maple syrup for each cup of sugar. NOTE: Since the recipe calls for 1 cup of granulated sugar and 1/2 cup of brown sugar, use in total about 1 cup of honey or maple syrup in the BATTER of this bread. 2. If baking with honey or maple syrup, reduce the oven temperature by 25 degrees Fahrenheit, since maple syrup and honey will tend to caramelize and burn faster than granulated sweeteners. NOTE: Instead of preheating the oven at 325 F, preheat at 300 degrees F. Since the temperature is lower, it will take more time to bake this banana bread. Do the toothpick test!!! 3. Since maple syrup and honey are somewhat acidic, when baking, you will need to add 1/4 – 1/2 tsp baking soda per cup of honey or maple syrup to the batter so it will rise. NOTE: I think the recipe calls for enough baking soda (1 tsp) for the amount of honey or maple syrup you will be using. 4. For this banana bread topping, use preferably maple syrup (it is more flavorful and less sticky than honey). You can heat about 1/4 to 1/3 of a cup of maple syrup (add a few drops of fresh lemon juice) and stir in 2 TBSP of butter, in order to brown or caramelize the sliced bananas. Then, follow the instructions stated in the recipe.